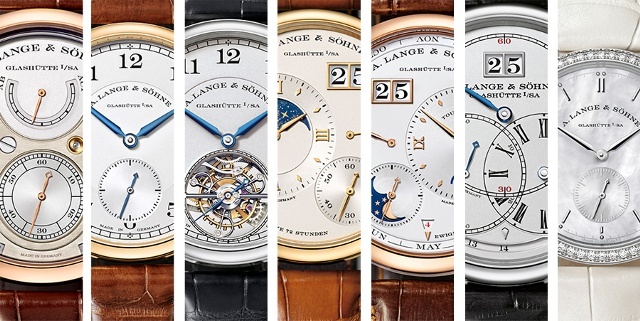 As the 2014 SIHH begins, exhibitor A. Lange & Söhne released seven new additions to its collections. Explore the interactive images for alternate views of the new timepieces and check back with iWMagazine.com all week for live coverage of the 2014 SIHH. Remember to follow iW on Twitter, Instagram and Facebook for first-hand looks into updates and debuts from the 2014 SIHH. In yellow, white or pink gold, the new 1815 timepiece features a caliber L051.1 manually wound movement comprised of 188 parts. Its functions include hours, minutes and subsidiary seconds with stop seconds. The case is 38.5mm in diameter and frames a solid silver dial with blued steel hands. 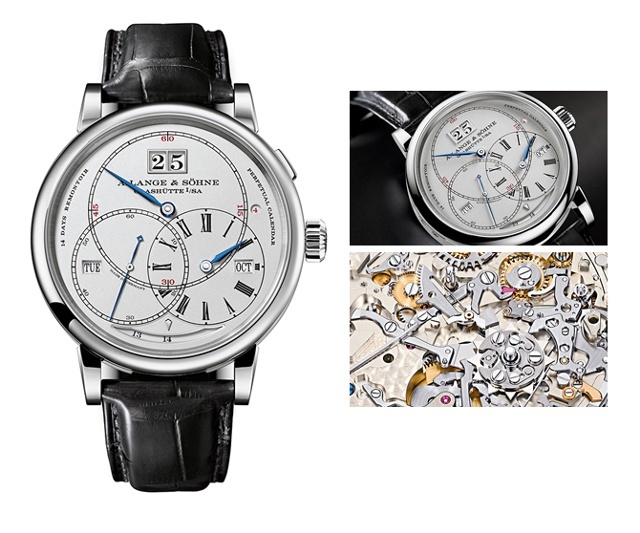 A first for A. Lange & Söhne, this model unites a stop-seconds mechanism and the tourbillon with a zero-reset function, allowing stop/start with one-second accuracy. The model is powered by a L102.1 movement comprised of 262 parts, lever escapement and shock-resistant screw balance all of which allowing a heart beat of 21,600 semi-oscillations per hour. The case is 39.5mm in diameter in pink gold or platinum (platinum limited to 100-pieces) both featuring a solid silver, argenté dial with blued steel hands. Featured prominently on the dial, the moonphase function here is designed to remain accurate for a whopping 122.6 years. 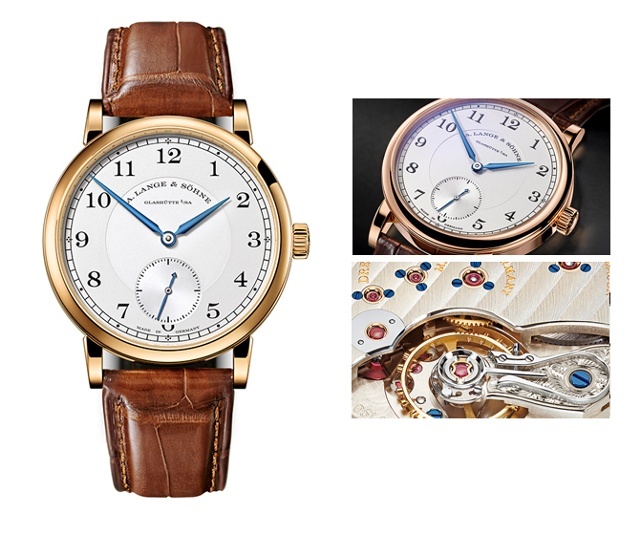 The timepiece is powered by a manually wound L095.3 movement with seven sccrewed gold chatons and 45 jewels contributing to the movement’s 446 parts. Additional functions include hours, minutes, subsidiary seconds with stop seconds, power reserve indication and an outsize date. The timepiece is 41mm in diameter with a solid silver dial framed by a yellow or pink gold case or a platinum case. Made popular by the mass of information elegantly displayed, the Lange 1 Tourbillon Perpetual Calendar is now offered in pink gold. 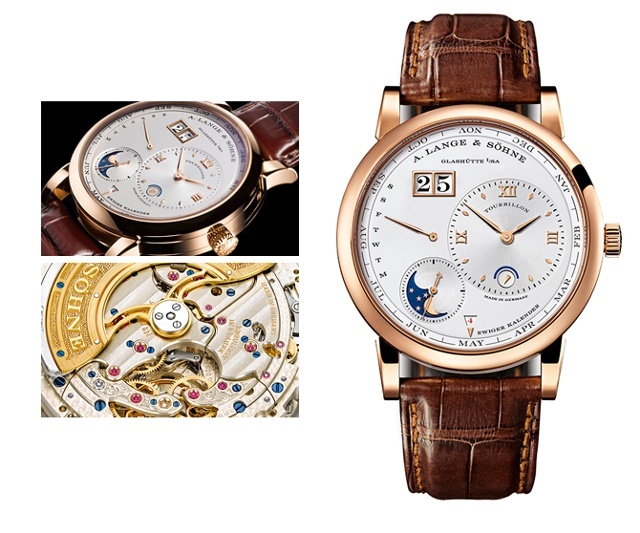 The timepiece is powered by a L082.1 self-winding timepiece with functions including hours, minutes, subsidiary seconds tourbillon with a patented stop-seconds mechanism, perpetual calendar with outsize date, day of the week, month, leap year, day/night indication and moonphase display. Built to represent the pinnacle of Saxon watchmaking industry, the Terraluna features three circles of time. Circles of time include a late minute circle at the top of the dial, and smaller circles beneath indicating hour and seconds. The model is powered by an L096.1 manually wound movement comprised of 787 parts. The case, in a variant of white or pink gold, is 45.5mm in diameter framing a solid silver argenté dial. 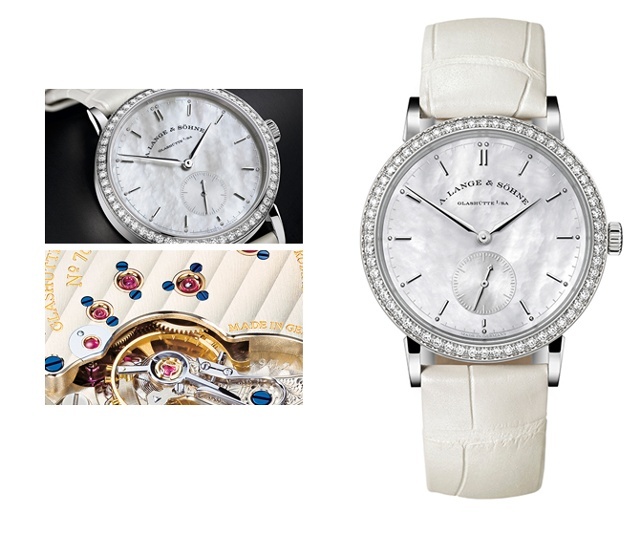 Two new Saxonia models marry horologcal precision with artisanship and feminine elegance. 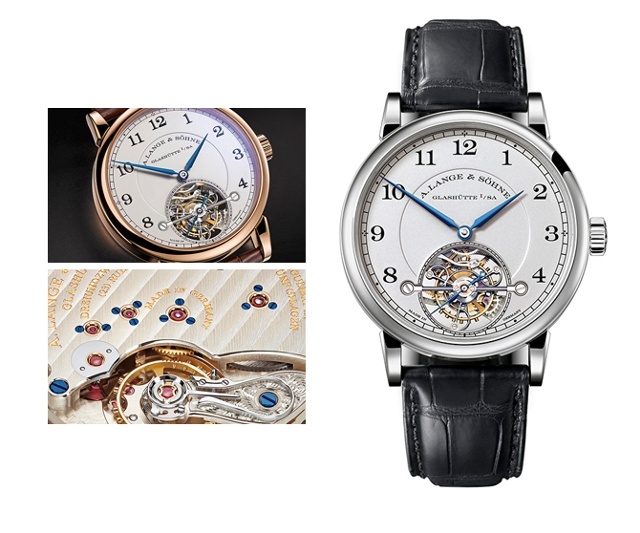 The timepieces are powered by an L941.2 caliber movement, manually wound. Functions include hours, minutes and subsidiary seconds with stop seconds. Both variants of the elegant model feature a white gold case, set with 60 brilliant-cut diamonds. 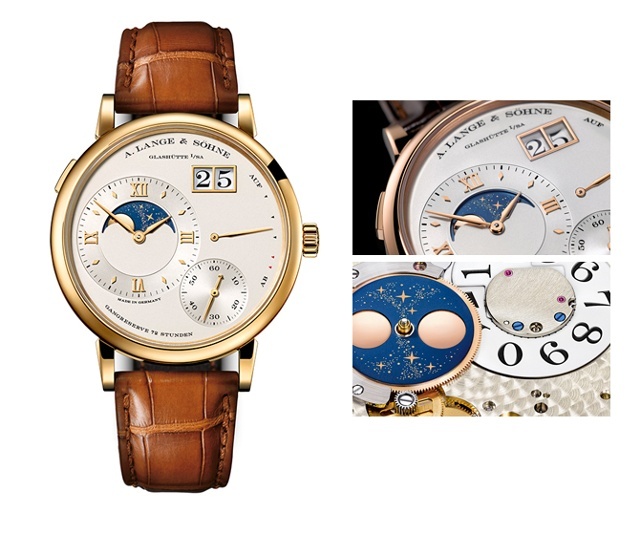 One variant contains a solid silver dial with white tint mother-of-pearl, while the other contains a solid silver with brown tint mother-of-pearl dial. 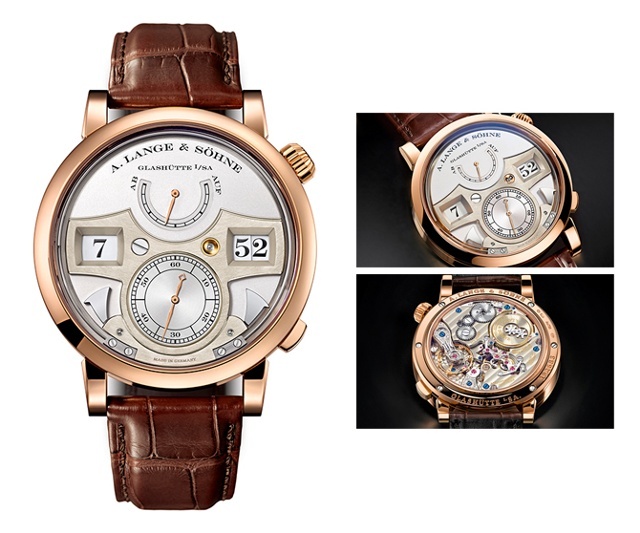 A. Lange & Söhne’s first timepiece with a chiming mechanism is now featured in pink gold. The timepiece is powered by an L043.3 movement comprised of 528 parts. Contributing to parts count, 78 jewels and two screwed gold chatons. Functions include time display with jumping hours and minutes, subsidiary seconds with stop seconds, a power-reserve indication and an acoustic signal for quarter hours and full hours.